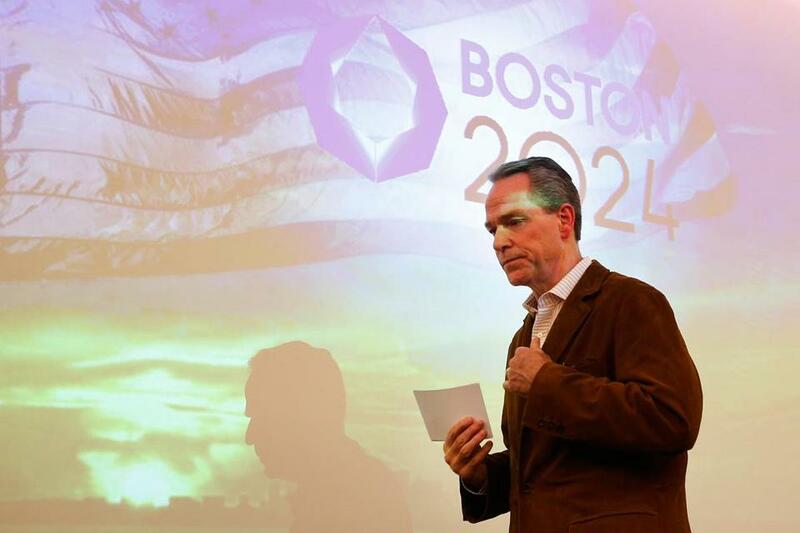 Boston 2024’s problem? It’s not John Fish, it’s us. “Is the conversation revolving around the future of the Commonwealth? If it’s not, then we’re not having the right conversation,” said John Fish, the chairman of Boston 2024. A lot of folks think John Fish is toast and should step aside as chairman of Boston 2024. So what does Fish have to say about all this? “If people don’t support my leadership, I’m a big boy. I’ll do what’s in the best interest of the bid and the city of Boston,” Fish told me Tuesday in a moment of self-reflection. It must be a confusing time for Fish. Here he is trying to do what he thinks is a good thing, to bring the Summer Games to the city and state, creating thousands of jobs and billions of dollars in economic development. And along the way, the Olympics just might get us a T that works all year round. But these days, it seems like whatever Boston 2024 says or does is the absolute wrong thing. Spruce up Franklin Park? No! Deval Patrick as global ambassador? Not for $7,500-a-day?#$! Sponsor a referendum? Those guys are co-opting the ballot process! “We believe that Boston can and should lead America’s bid” for the 2024 Summer Games, an official said. It’s as if we’re witnessing the last stages of a broken marriage. Now, we can sit here, Bostonians being Bostonians, and have a good chuckle. But know this: We’ve become the laughingstock of the world. Papers in France, Italy, and Germany are having a field day chronicling Boston’s self-implosion. Respected Olympic watcher Alan Abrahamson posted a scathing piece on Monday titled “Boston 2024 is doomed: be done with it,” urging the United States Olympic Committee to give the Games to LA. And the Wall Street Journal weighed in Tuesday, citing unnamed sources, saying the USOC may drop the Boston bid if local support doesn’t improve. The most recent WBUR poll showed that support has dropped to 36 percent, down from 51 percent in January. It’s easy for us to shoot the messenger, and if we take Fish out of the picture, people still won’t warm up to the idea of beach volleyball on the Common. Boston 2024’s problem? It’s not him, it’s us. Think about it. The group hasn’t spent a single penny of taxpayer money nor has a single shovel hit the ground, yet people act like Team Fish has been running up a public tab and the Games are a foregone conclusion. But this is more than just about Fish and his improbable dream. At stake is nothing less than Boston’s reputation. So far the world knows we’re great at taking people down, making sure nobody gets too big. Instead we should be showing how a city that pulled off the Democratic National Convention is now emerging as a life sciences capital and undergoing a wholesale makeover of its skyline. With this Olympic civil war, we risk damaging our city on a rise, not so much with the possible decision to bid on the Games but in the way we go about it. We’re at an important moment here, bigger than any one person. I get how Fish isn’t exactly a lovable figure, the ultra-successful businessman with his private jet and condo in the Mandarin Oriental. And he’s not used to the rest of us challenging him. Remember he’s a construction magnate, not a developer. As the chief executive of Suffolk Construction, he’s in the background on projects, not on the front lines going toe to toe with NIMBYs. And hosting the Olympics — siting some 30 venues at once — is bound to engage everyone who’s ever been against anything. “This is new for everybody. 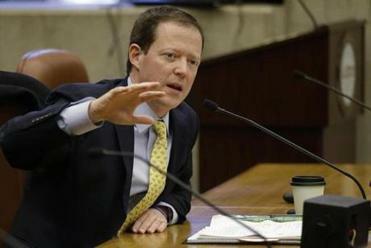 This is not just running a political campaign,” Fish said of bidding for an Olympics. Fish points out that even Mitt Romney, our former governor who swooped in to rescue the 2002 Salt Lake Winter Olympics, never led a bid for the Games. So what should happen here? We all need to take a deep breath. Fish should still be the chairman — but maybe more in the vein of traditional chairmen in corporate America: Be the steady hand, but behind the scenes. Eventually, Boston 2024 needs to put someone out front who can get more of us to understand the Olympic dream. Think Larry Bird with an MBA. Even with a great motivator, the case for the Olympics has to be more than just about playing host to the world. The bid has to be about the city’s future, where we want to be and how we get there. Fish can’t get us there. And until someone else does, we’re just going to keep rooting against ourselves. Shirley Leung is a Globe columnist. She can be reached at shirley.leung@ globe.com. Follow her on Twitter @leung.